Michael Pavone, Anthony Harlow, and former Itacate owner Jose Abarca recently opened a taqueria in Fairport along the Erie Canal. Named after Jose's wife, Lulu Taqueria is located at The Box Factory, with dining room windows facing the waterway and outdoor seating along the canal. During any season, the location of the restaurant is a good excuse for city dwellers to stop for lunch before or after work, and walk along the canal or visit Fairport's quaint shops and water views. Before Lulu opened, the owners had to figure out how to describe their food to customers. "There were so many people who didn't know what a taqueria was or even how to say it," Pavone says. "And then it was: 'You're a taqueria but you have a chicken sandwich on the menu.' And we were like, yeah we do, because these are our LA favorites that we want to share." Pavone adds that he finds the coolest part of being a chef is finding food you love all the way across the country and getting to recreate it here in Rochester. "The concept had to fit in with Fairport's locals," Pavone says. The menus offers both familiar items like the chicken sandwich and lengua (cow tongue) tacos for more adventurous guests. It's a special item that he and co-owner and Chef Anthony Harlow wanted to keep on the menu because it's a taco guests are less likely to find in the area. The menu at Lulu Taqueria focuses on LA street food, so it's like a translation of a translation of Mexican fare. "We definitely are not an authentic Mexican restaurant," Pavone says. "What's interesting, and what a lot of people don't know, is that Mexican food in LA is very different from what it is in Mexico." 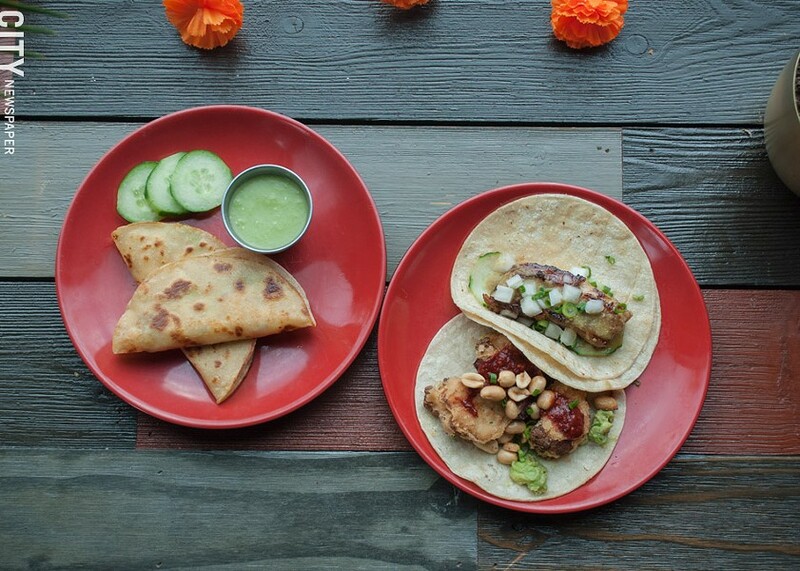 On the menu at Lulu Taqueria, from left: Smoked swordfish tacos are served with a side of salsa verde. The pork belly taco (top right) and cauliflower taco featuring avocado, peanuts, honey roja salsa (bottom right). Because Lulu Taqueria emphasizes LA-style tacos -- and each one has a specially paired (and house-made) salsa, aioli, or pico de gallo -- guests should be sure to order at least one taco from the menu. A quarter of the options are vegetarian and more than half are pescetarian. The cauliflower taco has sweet, spicy, and nutty flavors and a lot of crunch. This is the only taco featuring the house-made honey roja salsa, which it makes the dish especially fun. For those wanting to try the seafood options, the smoked swordfish is actually two meaty tacos for only $7.25 with a house-made salsa verde. But keep an eye on the menu for new items as they occasionally switch it up. At the bar, Lulu accommodates the local clientele who expect to be able to order a light lager and also offers brews from OSB Ciderworks as well as Lord Hobo. And they have several mezcal and tequila cocktails, all of which are under ten dollars. Most of the cocktails have a refreshing, citrus flavor and right now and they are featuring a mango margarita with cinnamon ($8), in theme of autumnal spices. 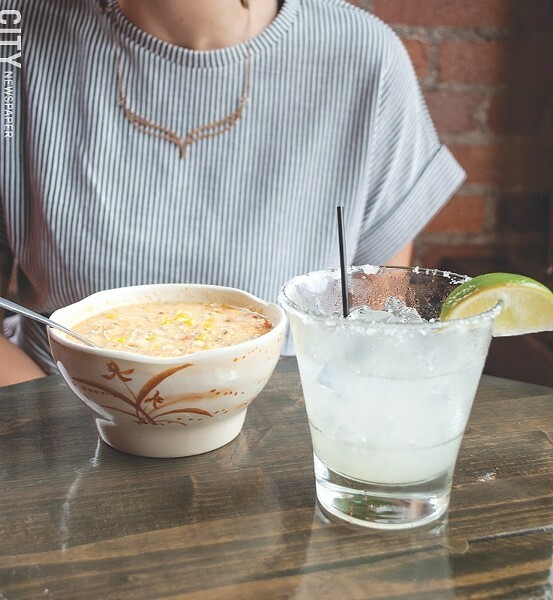 A warming roasted corn soup special and margarita. Pavone and Cure's Sous Chef Kyle Shafer recently collaborated on a French-Mexican fusion menu in November. They plan to host another collaboration in December, so keep an eye on their next event. Lulu Taqueria is located at 6 North Main Street in Fairport, and is open year-round. The menu is the same for lunch and dinner, and there is also a "rapido! rapido!" menu that accommodates the short, work-day lunch break. Hours are Tuesday through Thursday, 11:30 a.m. to 9 p.m.; Friday and Saturday, 11:30 a.m. to 10 p.m., closed Sunday and Monday. 377-0410; luluroc.com.